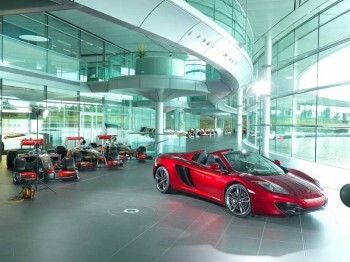 Your Neiman Marcus Edition 2013 McLaren 12C Spider—one of just 12 made—is heralded as the most technologically advanced supercar ever. With a push of a button, the butterfly wing-like doors open. You hit the big silver button and the 616 horse-powered V8 twin turbo engine begins to purr behind your seat. It’s all here—everything that makes a McLaren so coveted: the carbon-fiber composite chassis and Formula 1™ “brake steer, Seamless-Shift gearbox technology, and active aerodynamics. This car offers heart-pounding racecar performance. The incredible rush of hitting 60 mph in 3.2 seconds is exhilarating! The 2013 Neiman Marcus Edition McLaren 12C Spider in Volcano Red includes limited-edition features and a McLaren luggage set. Plus, you’ll receive a business-class trip to England for a VIP dinner with McLaren Chairman Ron Dennis and a tour of the McLaren Technology Center (February 6–8, 2013). For each sale, NM will donate $3,000 to Big Brothers Big Sisters, the nation’s mentoring leader in changing children’s lives for the better, forever. Reserve your 2013 Neiman Marcus Edition McLaren 12C Spider by calling 1-888-756-0775, beginning promptly at noon EDT on October 24, 2012.